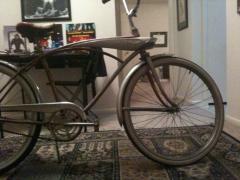 I am new to the world of Vintage Bikes, but as far as I can tell I have a 1961 J.C. Higgins Flightliner. 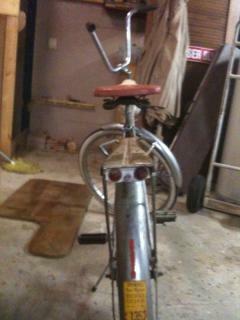 It has all original parts, but it is missing the headlight. I found the license sticker on it to be interesting. 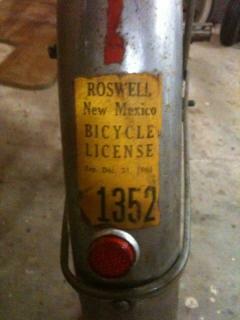 The sticker says the bike is from Roswell, New Mexico and that it expired Dec. 31st 1965. 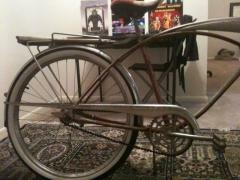 I got the bike in parts from a guy who was going to scrap it. I put it all together and think that it is pretty complete. 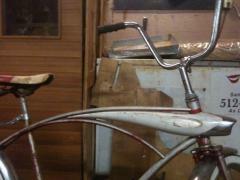 The front tire is original but I put a new white wall on the back. 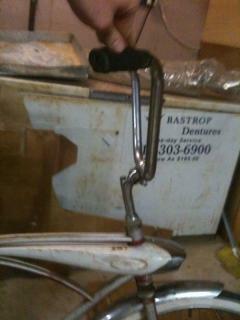 The only other things I have put on the bike are a kickstand and a small reflector on the back fender where a hole is to attach something or other. 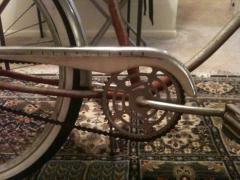 Some of the pictures I am showing currently, don’t have the chain guard in them. I went back to the guys house and found the chain guard later. It clearly says Flightliner in black print on it. I haven’t seen a picture of a Flightliner with the same handlebars as the one I have has, and am wondering if they are original. From what I can tell, they, and the grips are. It is in good condition and still bright in color. It is worn through in a small patch on either side from wear and tare. 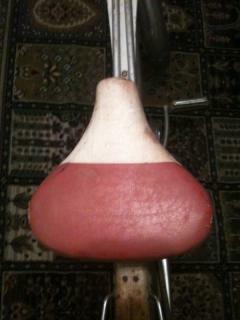 As far as the paint on the bike itself, it is in pretty good condition. All of the pin striping is still there. 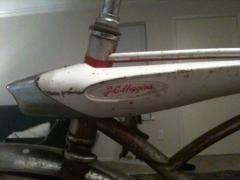 I believe I saw a picture of a ’61 Flightliner that had a saddle bag on it. I don’t have that or the headlight. 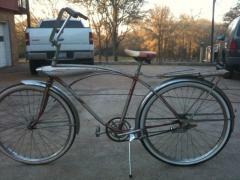 I am working on getting better pictures and would appreciate any information anyone might have on the bicycle.